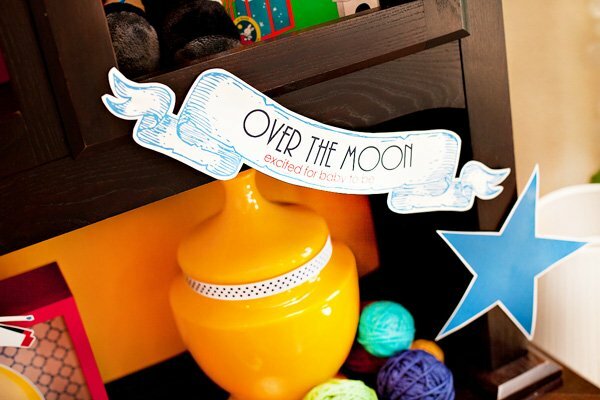 When I was asked to create a new baby shower theme inspired by the popular children’s book Goodnight Moon, I was pretty much “over the moon” myself! This theme was so much fun to work with because the book happens to be packed with tons of inspirational elements to build from – from the adorable pajama-clad bunny himself to other key “characters” like the cow jumping over the moon, the 3 little bears, and the lone red balloon. I was also excited to have a great excuse to revisit the Bedtime Story baby shower theme from years ago. It was definitely time for version 2.0! As with that original theme, standard 6-ft banquet tables were first transformed into “beds” here, using inexpensive bed linens & pillows. The rest of the theme was brought to life life utilizing key characters/elements from the book, playful patterns, vibrant colors, and Glue Dots galore! 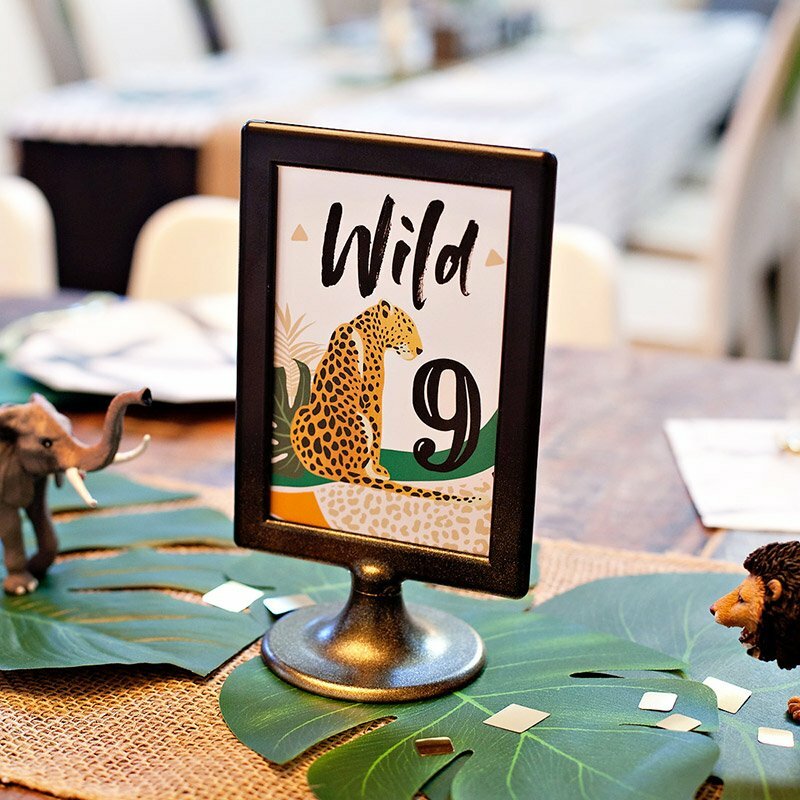 We have 2 tablescapes to share, plus a dessert table, themed drink ideas, 2 DIY projects, and a decorated hutch (which usually houses our barware & china!). 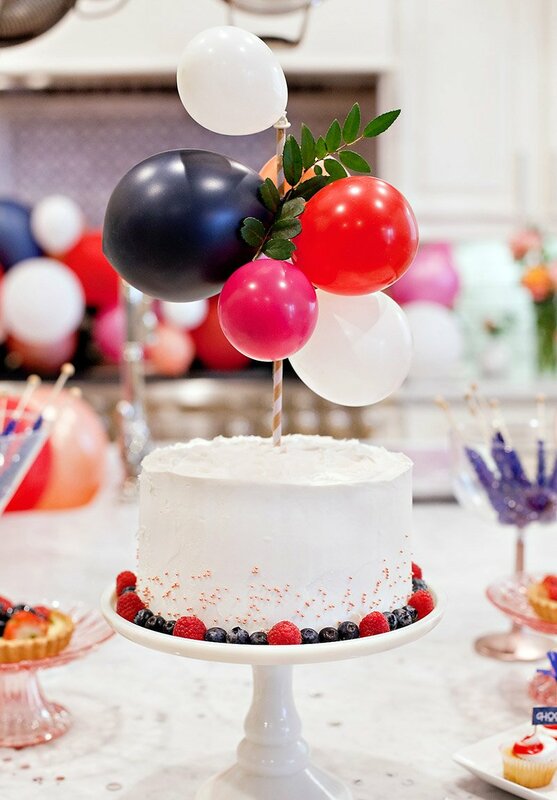 I REALLY hope you’re able to utilize some of these ideas for your own celebrations! There are TONS of images to share, so in an effort to keep this post from being a mile long, here we go with Part 1: Tabletop & Decor. 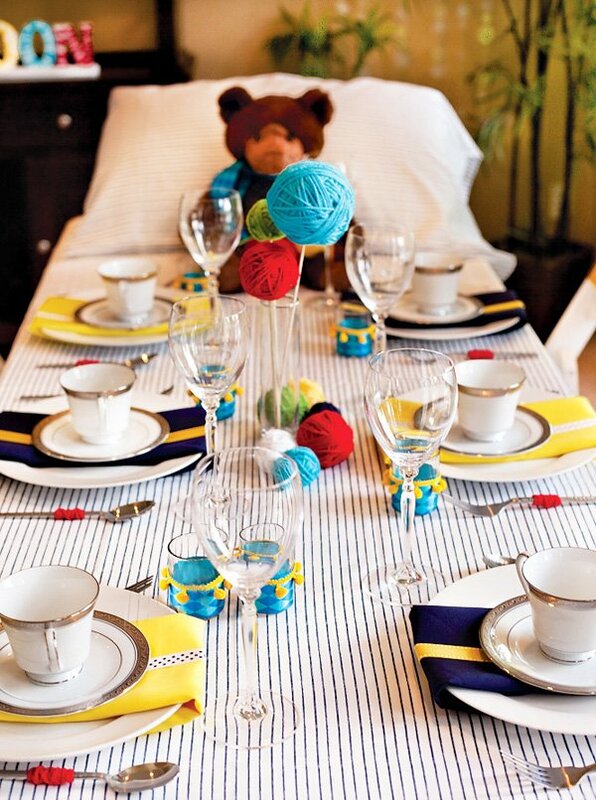 Navy blue and yellow napkins were wrapped vertically around everyday white plates and embellished with a band of contrasting ribbon. The ribbon was looped around the plate/napkin and secured at the ends (under the plate) with a Craft Glue Dot. Silverware was embellished with bright red yard to add another pop of color to the place settings. The ends of the yarn were secured with Mini Glue Dots. 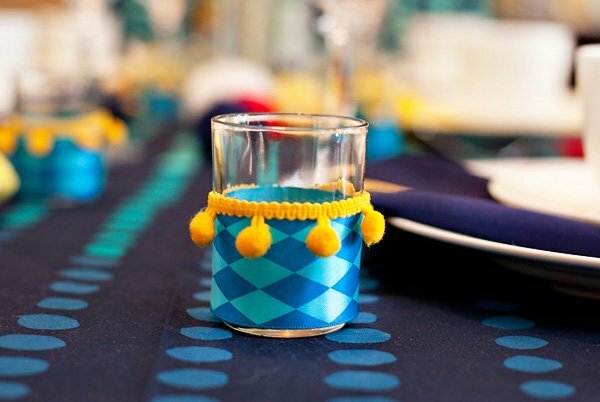 Embellished votive candles holders pull double duty as both party favors and table decor. I purchased a 16-pack of simple votive holders from Michaels for $7.99 and decorated each one with a wide band of satin ribbon and a thin band of pom pom trim (both also purchased at Michaels). 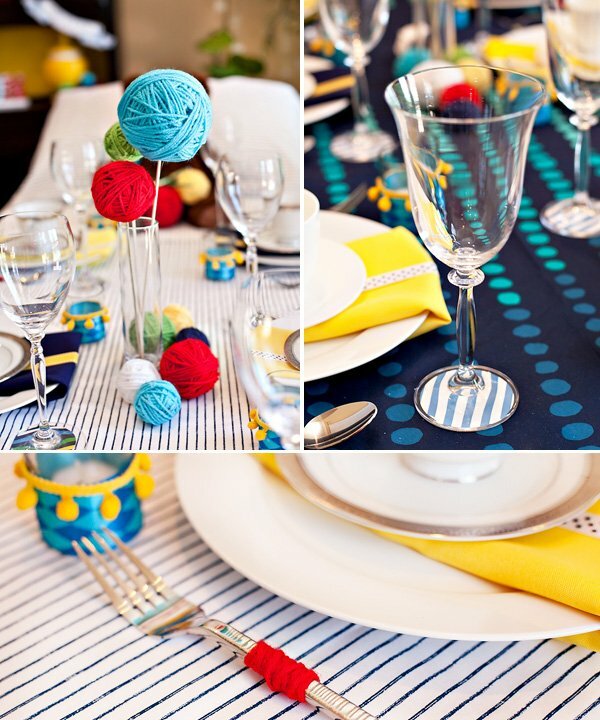 The center of the table was embellished with colorful yarn balls, which are basically sytrofoam balls completely covered in yarn. The ends of the yarn were secured with Mini Glue Dots and I attached some of the finished balls to wooden bamboo skewers to play on the idea of a floral centerpiece. Since the tables weren’t leaning against a wall/headboard, I used clear sturdy glasses to help keep the pillows propped up at an angle. 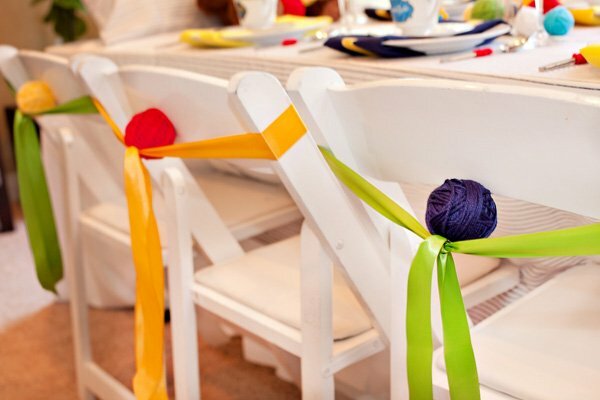 Wooden folding chairs were decorated with band of satin ribbon and a medium sized yarn ball. The tension between the ribbon and the back of the chair kept the yarn balls in place quite securely! As I mentioned before, the hutch you see here is usually utilized for our nicer barware and china on a typical day… but you’d probably never know that in looking at it now, right? =) We took out the glass doors and shelf and covered the back of the hutch (which is mirrored) with solid gift wrap in 3 colors. This instantly gave it a playful, childlike feel. 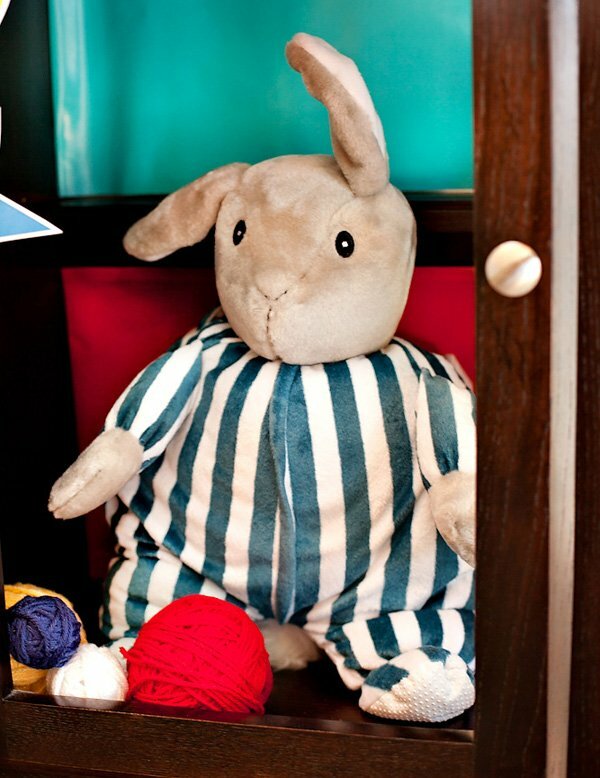 I found the big Goodnight Moon Bunny Storytime Pal on Amazon too. 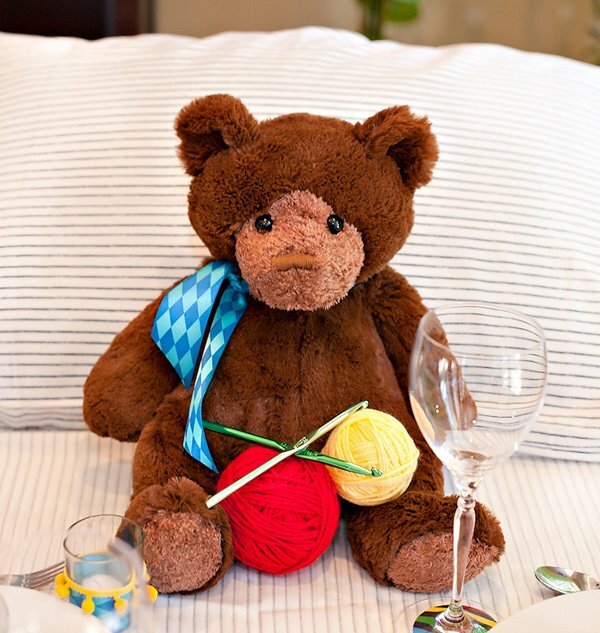 He’s actually a plush/blanket set, as the “stuffing” in his body is a blanket… makes for a great keepsake gift for mom after the party! The bright yellow vase & urn were also HomeGoods finds, and I added a band of the same black/white ribbon from the place settings to each one to help tie everything together. 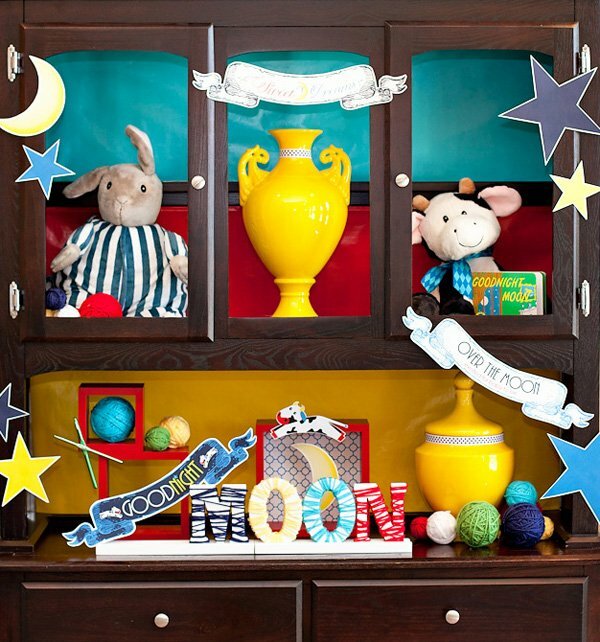 Wooden craft letters were embellished with yarn, and yarn balls were scattered throughout the hutch. Pop Up Glue Dots were used to attach crochet needles to square red wall shelves, which were repurposed here to act as party decor. (These came as a set of 3/$15 at Target.) 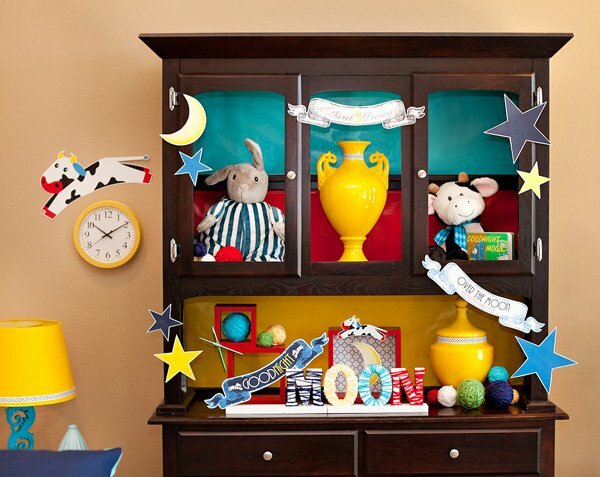 For the largest square shelf, I covered the back with patterned paper to give it the look of a shadow box, then hung a paper moon from the middle with fishing wire and stuck a “jumping” paper cow to the top! 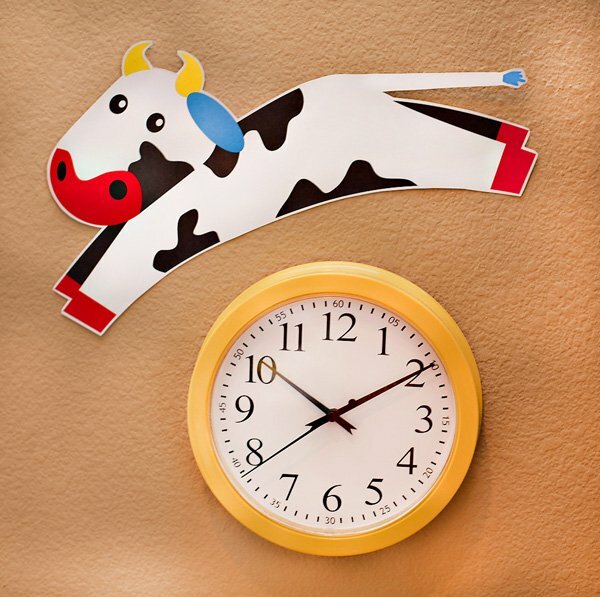 I placed a large “jumping” paper cow over a $3.50 wall clock from Target to play up both the “cow jumping over the moon” idea AND the clock element from the book. The clock was secured to the wall using Pop Up Glue Dots – no hammer required! I LOVE this!! Your attention to detail is amazing! 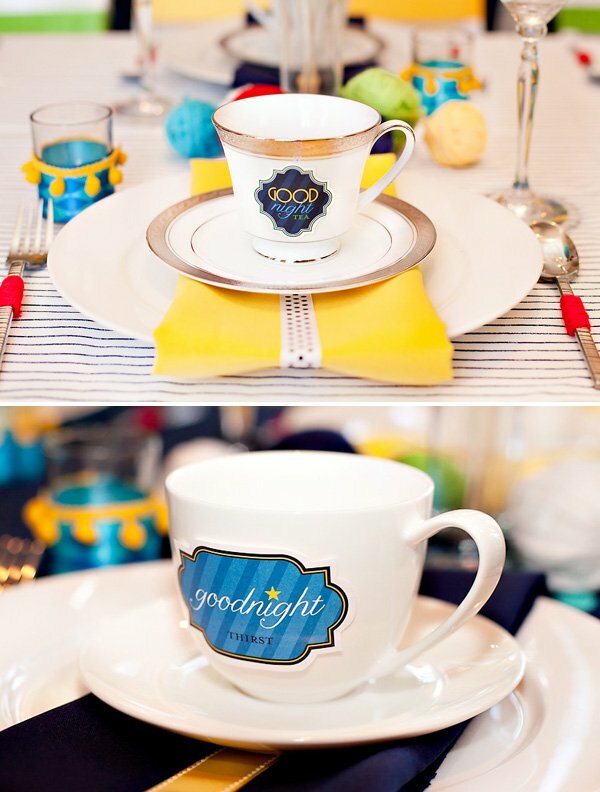 Even the wine glasses have coordinating circles… love, love, love!! No problem, thanks! Also, I always wonder what the invites to the party look like (and vendor credits for that) since I assume they are related to the theme… any chance of posting invitation pics as well in the blog pieces? The bunny is just so sweet! I LOVE this set. Very cute. 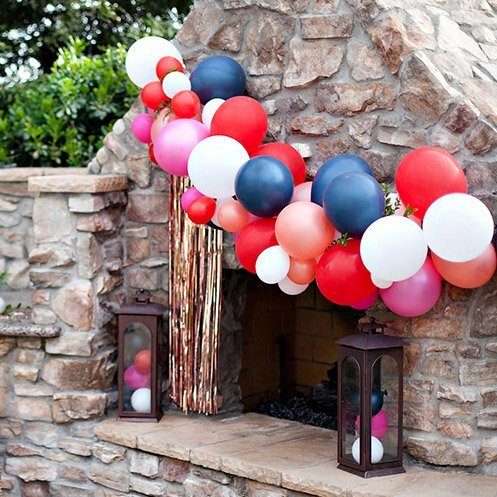 I love visiting your website for wonderful party ideas and projects. Thanks! I love all the details! 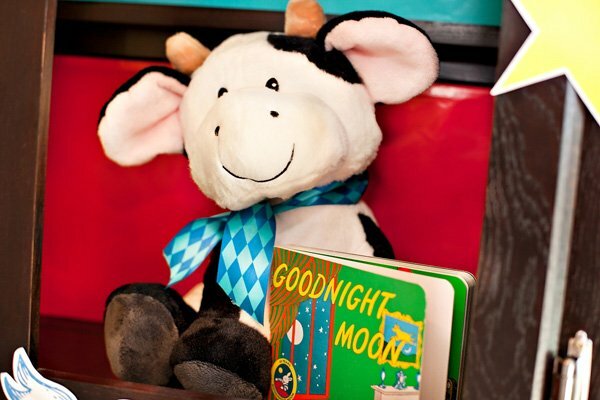 Thank you so much for the free printables :) Where did you get the stuffed animal cow from? It’s so cute! Children’s books are a wonderful place for inspiration; they already have the right age-group in mind, and their colors and their motifs are perfect for adaptation. 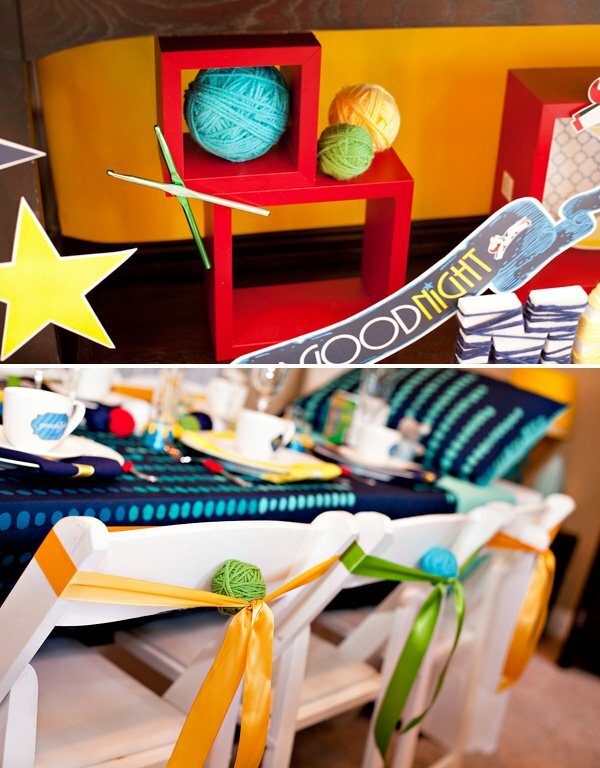 Nice to see that an ‘old’ book can make a ‘new’ party theme – well done. Gorgeous, as always, Jenn! You have such a “look” about your work – your signature touch which always transforms the theme into a beautiful statement. GREAT WORK! so great! We read this book almost every night, my daughter loves it! I love it and thanks for sharing with us. Your work is always fun and creative. 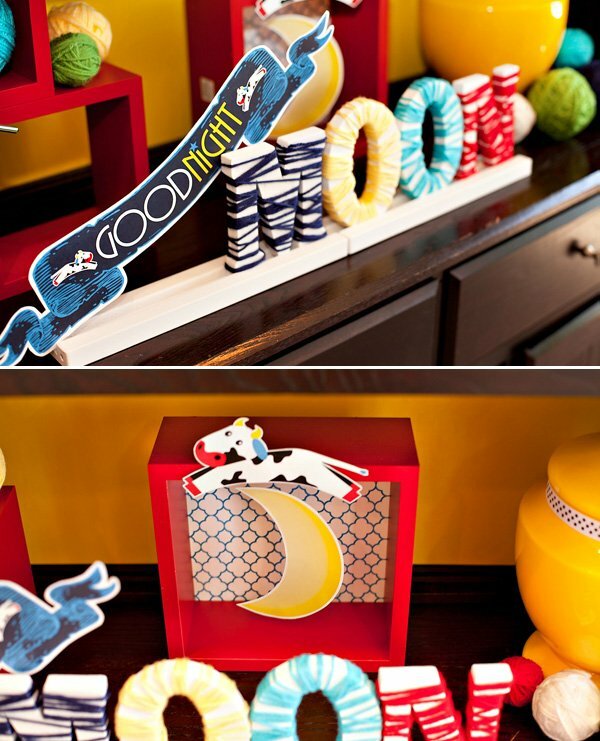 Jenn, thank you so much for breathing life into our “Good Night Moon” inspired theme! We can’t wait to see the rest of the ideas! This is beyond cute! “Goodnight Moon” is a classic, and this shower gives it such a sweet, modern feel. Great job! This is very cute!! Great job on the bunnys as well.!! 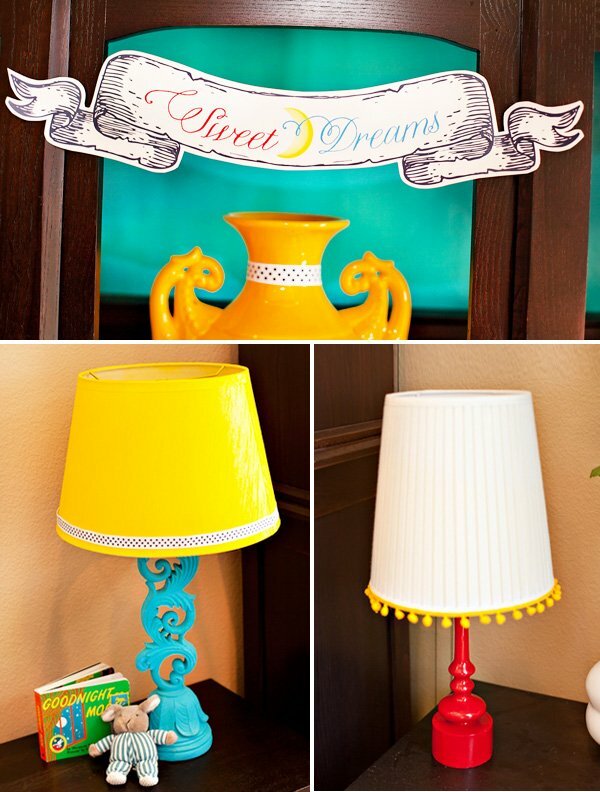 hi jenn, i would love to know the name of the font used for the sweet dreams signage. Hey! Is there an invitation to go along with this shower? 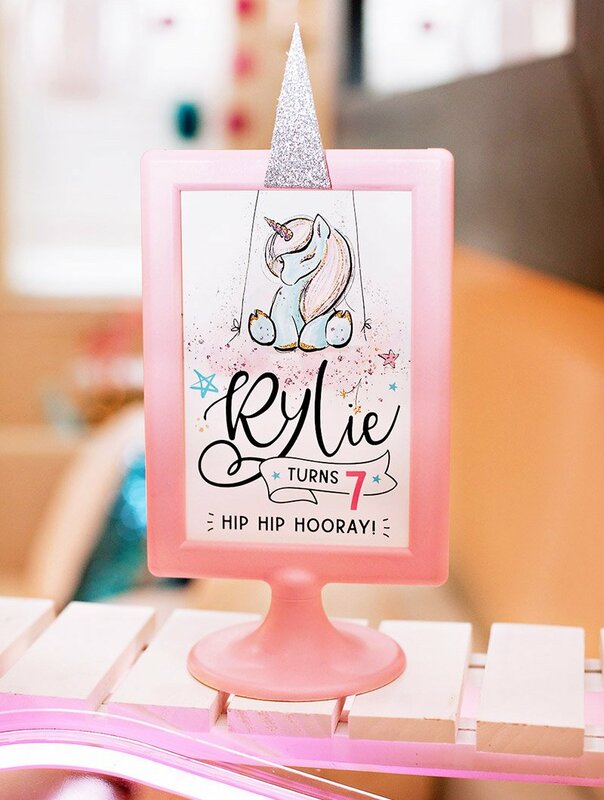 My SIL wants this theme for her baby shower and we also incorporate your Twlight bachelorette theme into a baby shower for a great friend too. 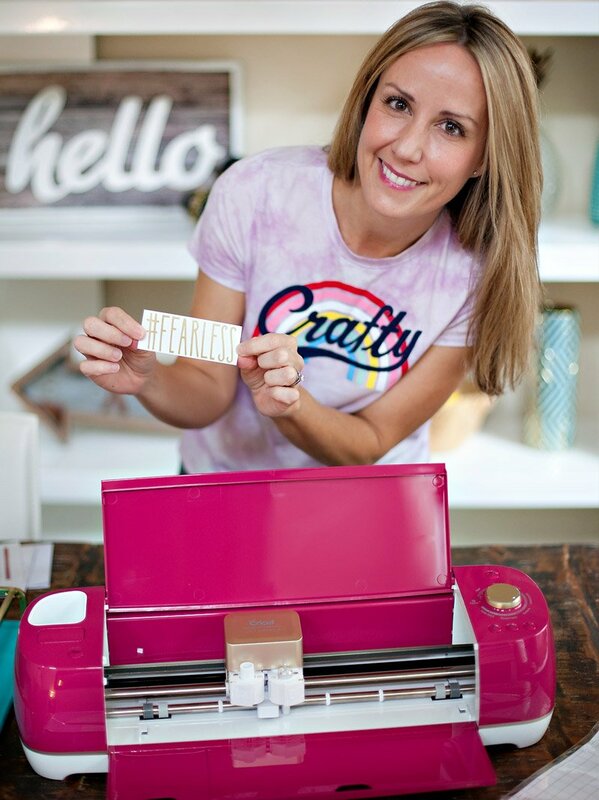 Please post a DIY invitation too!! 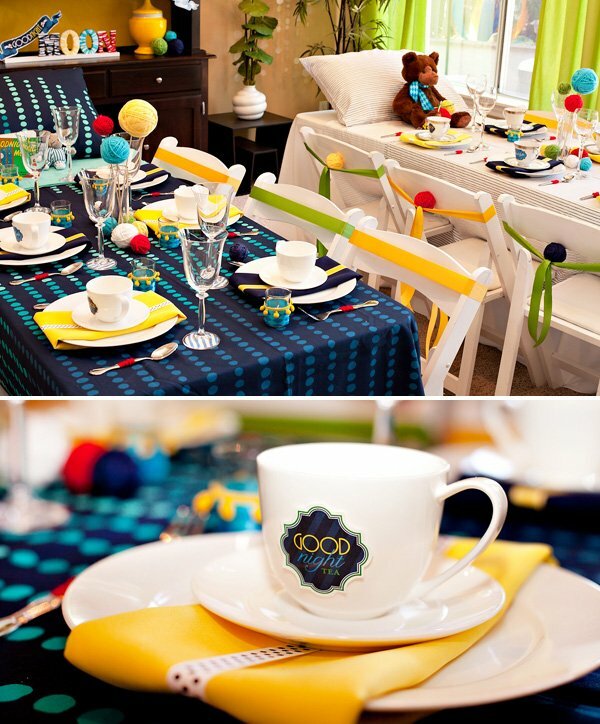 This is the most brilliant baby shower theme I have ever seen! I have a pony whose Show name is Goodnight Moon…and she's pregnant right now- I think finding this just convinced me she needs to have a shower! 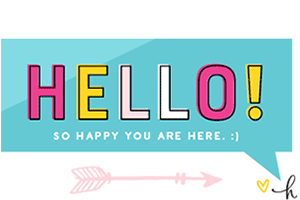 Did I miss it or is there a download button for the printables on here somewhere that I am completely missing? Thank you so much! The download links are kind of interspersed throughout the text – usually I put them in one clean list now, but this party was from a few years ago when things were a bit messier ;) I gathered them for you here though – hope this helps! I love the details! Can I print the stars, cows and moons? I didn’t see any links for those images. Thanks!